You would not say it about one of the world’s largest and most militant religions (that shall remain nameless for fear of reprisals), but the world would probably be a way more tranquil place if there were more Buddhists. Yes, they have been pulled into conflicts in Southeast Asia, but it has mostly been in response to the belligerence of a less tolerant religion. 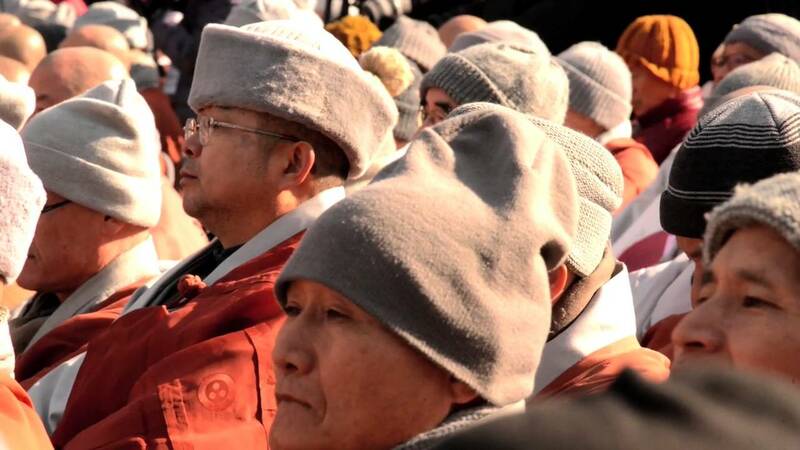 You can practically see that commitment to peacefulness baked into Buddhist customs and ceremonies. Seoungho Cho uses the form of Buddhist rituals to meditate on its inner essence in the experimental short film, Scrumped [Extended Version] (trailer here), which screens as part of the 2016 Doc Fortnight at MoMA. Mostly, the Korean-born New York-based Cho relies on the ambient sounds of worship recorded at the Haeinsa and Silsangsa Temples in South Korea, but he occasionally also incorporates excerpts from Gabriel Fauré’s Requiem, op. 48. Arguably, it is not such a strange fit, considering the “High Church” vibe of Buddhist chants (it is also worth noting the Japanese Catholic Church has forged particularly close ties with their Buddhist counterparts). Regardless, the first ten minutes or so of Scrumped look like Cho is feeling his way, without a clear concept in place. However, when he starts editing footage according to the rhythms of the ceremonial chanting, the film becomes a transfixing experience. Mind, spirit, nature, and art all whirl together in a microcosmic unity. The film’s aesthetic truly reflects the spiritual transcendence of the worship it documents, which is rather remarkable. Frankly, Scrumped becomes the sort of cinematic wonder Samsara was billed as, but fell short of. It is entirely possible Cho’s shorter cut is sufficient, because the thirty minute “Extended Version” has its share of filler up top, but the guts of the film are absolutely engrossing. Although Cho professes to be a spiritual non-believer, his respect and affinity for Zen-related Korean Seon Buddhism are well evident. Highly recommended as an immersive and meditative experience, Scrumped screens again with Jacques Perconte’s Ettrick tomorrow (2/29), during this year’s Doc Fortnight at MoMA.